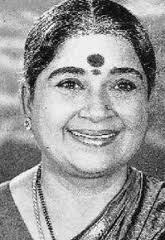 Pandari Bai(1930 – January 29, 2003) was a prominent heroine of South Indian languages films mostly in Kannada and Tamil during the 1950s and 60s. She has the distinction of having acted as both heroine and mother to stalwarts such as Rajkumar and Sivaji Ganesan. She was the heroine in Dr Rajkumar's debut movie Bedara Kannappa and also Sivaji's debut movie Parasakthi. Born in Bhatkal, Karnataka, in present Uttara Kannada, into an orthodox yet artistic Saraswat Brahmin family, where her father was a drawing master and a Harikatha exponent, and also a stage actor. He taught her the art of Harikatha, thus even before she was ten year old, Pandari started giving Harikatha performances. She had acted in a thousand five hundred films in several languages like Kannada, Tamil, Telugu, and Hindi and enjoyed a long career span of nearly half a century. She had played lead roles in many movies with success and then switched over to character roles. Besides being attractive, she had a glowing inner beauty and a distinctive affectionate air about her which made her an ideal screen mother. Her soft looks and dialogue delivery also added luster and depth to such roles.In her later career, she played the mother of stars older than she and with most of whom she had played the lead in her earlier years. She also played as mother to actors like M. G. Ramachandran in Tamil and Rajesh Khanna in Hindi in the 1970s.Pandari Bai also acted in a couple of Kannada TV serials Amma and Manethana (1998–2000). Both of them were produced by her sister Mynavathy's company Yantra Media.. తెలుగులో చాలా చిత్రాలలో ఎన్.టి.రామారావు, అక్కినేని నాగేశ్వరరావులకు తల్లిగా నటించారు.